Ozeri is a specialty manufacturer of digital lifestyle products for the modern home. They have many ‘techy’ and innovative products, all with that sleek, modern look. From book lights to bathroom scales to Tungsten Carbide rings! 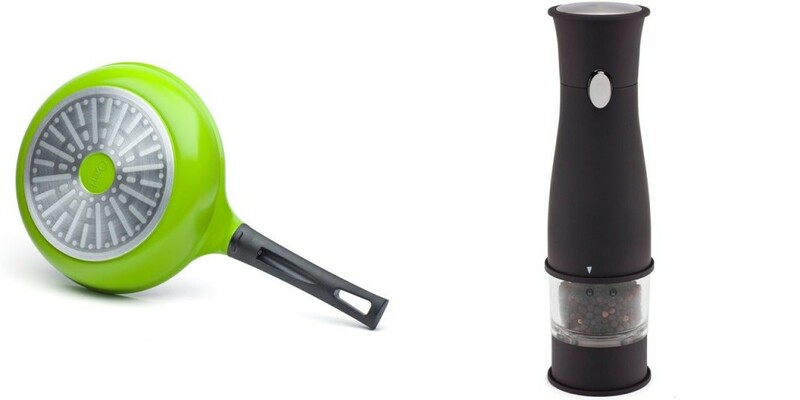 For the Kitchen today, we are going to chat about their Green Earth Frying Pan & Electric Pepper Grinder. Both sound neat, huh? I do not remember the last time I owned a good non-stick frying pan, or any type of non-stick cookware, as I have stayed away from those type of tools when I learned about the harmful chemicals that are used in them and how they releases toxic fumes when cooking at hot temperatures. Very harmful to your health and I hope everyone is staying away from it! Ozeri’s 8″ Green Earth Frying Pan utilizes a natural ceramic coating while free of PTFE, PFOA and other harmful chemicals. This special coating also makes it more durable and scratch resistant. I couldn’t wait to try it out! 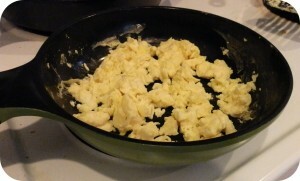 I definitely need a bigger size because there isn’t much I make in a small pan, but it was great for my scrambled eggs. Oh my, you should have seen my mouth drop as I was frying them up! I could not believe how easily the eggs were to cook ~ with no sticking! Gosh, I have been really missing out with these non-stick pans. I totally forgot how great they are! I am not exaggerating when I say my eggs have never been fluffier. It is made of the highest quality anodized aluminum that allows for even cooking. I could definitely tell! Or maybe that is because I’m used to a pan that tilts to one side? Cleanup? A breeze! The egg remnants peeled right off! No scrubbing here. Love it! I got spoiled with the Artesio Soft Touch Electric Pepper Mill & Grinder. Who knew I needed such a great contraption? I used to buy the whole peppercorns that come in the cheap ready-to-grind containers. No more! I can now grab peppercorns in bulk which will definitely save me in the long run. I can try out salt and other spices too! The grinder has some really neat features ~ built-in light, soft non-slip grip, and lets you grind from fine to course. It is just the right size to fit in my hand and to store in the cupboard. Plus it just looks nice. The kids are in love because you just push the button and out it comes. C’Man even wanted some pepper on his sandwich! I think it will be pepper city around here from now on. Win a 8″ Earth Green Frying Pan ~ 3 Winners! 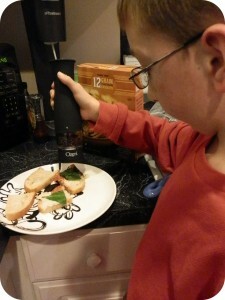 & Artesio Electric Pepper Grinder ~ 10 Winners! I received these products for review and was not compensated in any way and all opinions are my own. This giveaway will end on March 21, 2012 at midnight EST. Winners will be drawn via rafflecopter. Once a winner is drawn I will contact them and they will have 48 hours to reply before I draw a new winner. Giveaway is open to anyone in the US and you must be 18 years of age or older. Giveaway not affiliated with Facebook & I release them of liability. Winner will be posted in the rafflecopter widget. I only use non-stick coated pans! They are the best and super easy to clean! Thanks for the opportunity! I plan to give this pan to my husband as a present. He does all the cooking in our house and I'm sure he would love a pan like this. I just made bread in my iron cast dutch oven! I use stainless steel pans--very nice for some things, but very sticky for others. All of my pans are from the thrift store, lol. I'm in desperate need of new pans! Thanks for the chance to win this one! Thanks for offering this giveaway. My current pan's teflon is all worn out. I could really use some new non-stick pans. I use a very nice pan set my parents got me about 12 years ago. They are still in great condition and I love them! They are Armour stainless steel. I don't even think they make them anymore. We use stainless steel or cast iron - we try to avoid teflon too. I currently cook with red Kitchenaid pots and pans. I make it a point to avoid teflon coatings. The Earth Green pan sounds great. i use ecolution nonstick pans and cast iron. thanks for the chance! I use a crappy hand me down set. i would love for my daughter to try this pan, i have one and i love it! I really need to replace my frying pan with one that's non toxic! My pans are a T-fal set my husband and I bought about 3 years ago. We just never seem to have enough frying pans, though, so this is a wonderful giveaway! I have very old farberware-37 years. But for many many things I use my nonstick pans. This I hope to win for my daughter who has no nonstick pan. Thank you for the giveaway! I am using a hand me down frying pan and its just not cutting it anymore. Crossing my fingers! I usually cook with a cast-iron skillet and stainless steel pans. We use a lot of cast iron pans, but I don't like how heavy they are to lift. My wrists just aren't very strong. I do not have a non stick pan for eggs, so a win would be great! Also, with arthritis, a automatic peppermill would come in handy so either prize would be appreciated! I use a variety of stuff that I have accumulated!! I really need to get a good set soon!! I have an incredible set of pots and pans, but my teenager is getting ready to head off to college next year ... and my spare set of pots and pans are in my RV. He's outta luck! We have stainless steel but man sometimes they are so hard to clean! I got some cheap frying pans from WalMart when we moved and they're already starting to wear! I cook with teflon cookware. My pans are about 15(ish) years old and really bad. my pans would not have food stick to them when I cook. We have Cuisinart which I have been very disappointed with! I have an assortment of pans that I cook with - some are stainless steel, others that I use for making omelettes are non-stick. It just depends on what I'm cooking. Thanks for a great giveaway! the cooking pans we've had since I first got married almost 7 years ago. Need some new ones. We have a some non-stick pans, they are great. Easy clean up. I use skillets now but am missing a small sized one so this giveaway would be perfect! Thanks so much! I use a soup pot now too cook soup but I definitely could use a skillet too! I need new skillets BAD! I received a set for Christmas from my dad about 3 years ago and the non-stick coating is scratched, one is warped on the bottom so it doesn't sit flush on the burner, etc etc. My cookware is even worse! It hasn't been replaced in over 10 years plus I inherited some of my grandparent's pots and pans that are easily older than me (I like these pots and pans better than my T-Fal ones!). I use stainless steel and nonstick. I cook with nonstick pans, yet lately, the heavy cast iron pans have been working better for me. My pans are so old I'm not even sure what they are! i have a set of stainless steel cuisinart. We use teflon coated pans and mostly use our wok. My husband loves these type of pans. I have Meijer brand pots and pans. I have some old store bought ones...I cook A LOT so I need some good pans:) keeping my fingers crossed ...thank you for reviewing this! I have the small size supposedly non stick pan that I make scrambled eggs or omelets in. But it sticks quite alot. I have been wanting this pan. Thanks, CBM for the chance to win it! :)! I have a set of T-Fal pots and pans...but they are starting to show their age. I will use whatever pots are clean. My cookware is a mish mash of different sizes. We cook most meals with a 12" stainless steel frying pan. We do have one teflon pan that I want to not use, but eggs stick TERRIBLE in the stainless pan. I cook with a non-stick pan. I LOVE the Ozeri Frying Pan!!! I have a combination of different brands of pans. I love cooking, this would be so nice to have! I primarily cook with my cast iron pans. I try to avoid non-stick coatings that aren't free of chemicals. The additional iron I glean from them is also a bonus. We always use a pepper grinder, having an electric one would be great. I mostly use my Emril Cast Iron Skillet for everything. I have stainless steel pans and in the 10 years I've had them I've yet to find anything I can't simply soak & wash out of them! I use non stick,cast iron and stainless steel depending upon what I'm making. I have a set of kitchen aid pots and pans but i want to switch from the non stick to something more healthy. I cook with regular stainless steel pans at the moment, but this one would be a great addition to my kitchen! I use standard stainless steel pans. Teflon scares me! I cook only with TFal Teflon coated pans! right now, I'm using rachael ray pans! This would be an awesome addition to our kitchen arsenal! We do have some non-stick pans we got for our wedding (i know, I know!) that are absolutely dying, and the chance to both replace one and upgrade at the same time would rock! I cook with regular non-stick pans that I have had forever! Would love to win! Thank you! I love a small pan as this one for frying an egg or making one boca burger ect. Thanks for the giveaway! I have a set of Emeril cookware that I use right now, but I've had it about 10 years so a new one is in the plans soon! We have a mix/match assortment of pots and pans.... some of which definitely need an upgrade! I cook with pink kitchenaid cookware I purchase for breast cancer awareness. We use anything that is non Teflon, but do need some new ones! Right now I slowly replacing my regular non-stick pans with "greener" pans. I also plan to invest in a cast iron set in the future. Hi! I'm currently using Tramontina cookware that my husband bought For me a few years ago. I have no idea what brand of pans I use, it has been so long since I have had any new ones! I have all clad pots and pans, but I REALLY need a non stick pan!! I usually use stainless steel pans. Thanks for the wonderful giveaway... I usually use SS pans. I like Teflon. I have no idea what my are, they are all different. I cook with whatever pans i can afford! Thank you! I cook with a small set of Calphalon cookware and I also have one Green Frying Pan that I received through a House Party Kraft event and it is my favorite pan to cook in!! I just love it!!! 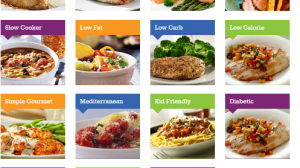 surviving cancer I try to avoid any chemicals in food and products I use! Right now I have a non stick one that I got for a wedding present, and use to cook eggs, etc. It is wearing out though! I like cast iron cookwear too. This Ozeri pan sounds wonderful for things like eggs! My pans are so old, I don't even know what kind they are. Thank you for hosting this great giveaway! :) I use a few different kinds of pans, cast iron, stainless steel and calphalon. my old college pans are a peeling embarrassing mess....been wanting to try one of the pans and see if i like it before committing to a whole set! My pans are hand me downs and would love a good quality pan to cook with. I have 2 non-stick kitchen aid pans. I love them, but they are getting old and needing replaced. I cook with non stick and heat resistant pans. I have a set from Green Pan that I cook with and loooooove. Got it from Target a few years back. We've been switching over to cast iron pans. I have a mix of pans. Thank you for the giveaway! I currently am using a hodgepodge of pans...some are stainless, others non-stick & I just purchased a ceramic pan. Thanks for the giveaway! my pans are old - this would be a great addition! I have some old pots and pans. I'd love to own this grinder----it'd be like being in a fancy smancy restaurant! I have been using Pampered Chef pots and pans for years. We just use regular cheap no-stick pans. My favorite pan is my cast iron. It seems to be the most consistent heat wise. I cook with old, old pans. I'm pretty sure they hate me! Nice giveaway. Thank you. I'm currently using the pans I received as a wedding gift. They're old but they've held up beautifully. I really enjoy baking with my Stoneware pans! They seem to bake more evenly than regular metal pans. I sure could use a good non stick skillet. I cook with a mixture of my old pans and my Mom's old pans. We have a stainless steel set that needs to be replaced! I usually cook only in non-stck pans. I would love to buy a stainless steel pot set to try. I use T-Fal right now. I cook with non-stick pans and make wonderful omelettes. I usually use a teflon frying pan. My favorite is wearing out. We cook with teflon frying pans most of the time. I'm using a set of T-fal pans ヅ *Thanks* for the giveaway! I use regular non stick pans, but I'm in dyer need of new ones. I cook with T-Fal, which is good quality for the money you spend. I use a combination of T-fal & cast iron cookware that's been handed down by my grandmother. I only cook with farbreware or cooks pots and pans ... i like farberware, my inlaws insist on cooks so they made my husband get so for "when they're here" once a year LOL pans are a touchy subject in my house - but pepper grinders aren't and i need one! I cook with Emerils stainless steel pots and pans for years. These will last a life time and I love them. Both of these prizes are nice, I would extremely happy with either, as they both would get a lot of use. Thanks for the giveaway!! I use whatever I can find. Although I would prefer the frying pan (my current small one has definitely seen better days), the pepper grinder would be nice as well. I still use my old pans from college so this would be a great prize to win. Thanks! We are burning alot with the little fry pan I have, it used to work ok but now everything just keeps sticking. I think it's time for the trash. I currently cook with a set of Paula Deen pans. I've been using a set of Calphalon pots and pans for years and they're getting pretty scruffy looking. Right now we use Rachel Ray cookware. It is awesome but the orange coloring keeps coming off on my dish rag. Im using a set Hubby had in his house dont know the brand.. just know it's not any of the fancy stuff(teflon, nonstick). We havent upgraded for 4yrs. I have a set of Rachel Ray pans.they are ok but the non-stick has started comin off. I cook with the teflon coated pans, which eventually ends up in the food. I cook with a set of pots and pans I got from Walmart a few years ago. I'm surprised at how well they've held up considering they were only $20, and they are very easy to clean to not be non stick pans. My current pans are pitiful, mostly hand me downs. Would love to have this nice pan. I cook with calphlon stainless, but sometimes you really need non-stick, so the pan would be great! My husband got me a Wolfgang Puck set that I love! I currently have really old yucky pans that the no stick stuff is peeling off of. Not healthy, but pans are so expensive! I cook with "Everyday" from Bed, bath and Beyond. My wife bought me a set of hard anodized cookware at Sam's about 10 years ago. My current pans are pretty much shot! I current cook with a T-Fal pan. My wife usually does the cooking. I cook with pans which I inherited from my mom. Some of them are pretty worn and torn but I love her old cast iron skillet! We use a lot of fry / saute pans in all sizes and including very large woks (in almost all cases we use non-stick. We also have a set of wonderful Paula Deen non-stick cookware. It's nice and heavy, cooks evenly, is easy to clean and very good looking too! I've always heard great things about Ozeri products and we would love to try (own) either the fry pan or the electric pepper grinder. Thanks! I cook with a variety of pans, most of which were bought from a door to door salesman. Something about the school where I graduated from...I didn't graduate from the school they mentioned, but got the HIGHLY expensive "deal" anyway. I currently have a set of the Rachael Ray pans. They are quite nice. Cast iron skillets. But they are SO HEAVY! I use Emeril's pots and pans along with cast iron skillets as well. i have a t-fal frying pan i use a lot. i have a few caphalon pans as well and some le creuset i use for stews. I like to cook with the copper pots that i inherited from my grandmother. I cook with stainless steel. We cook with these swiss diamond coated ones. I use cast iron skillets. Thanks for the giveaway. Love any anodized they never burn, and clean up a breeze. I use a hodge podge of pans. I wish I had a whole set. I got a very expensive set of non-stick pans a couple of years ago and don't like them at all. I prefer the cheaper non-stick set from about 20 years ago or the single stainless steel pan I use all the time. It all depends on what I'm making, but for the most part, my go to pan is my Cast Iron pan. It's about 15 years old, has a crack smack through the middle of it, but gives food such an amazing taste! I dread the day that I have to retire it! I just use a standard inexpensive nonstick frying pan. I do LOVE and own Revere Ware pots and pans though! Thank You!